The Key: Young Critics Mentorship Program brings students to various productions around Chicago, teaching them about arts criticism as they try their hand at writing reviews. The opinions of the students are their own; we workshop the pieces in seminar every other week, and then they edit their reviews before publication. This week we are sharing their second round of reviews on The Heavens Are Hung in Black at Shattered Globe Theatre, which closed Oct. 21st, and Two Mile Hollow at First Floor Theater which closed Nov 4th. Workshopped and Edited by co-facilitators Regina Victor and Oliver Sava. Lenses: Age 20, Male, Queer, White, Neuro-Atypical, Writer. If you go to see Shattered Globe’s The Heavens Are Hung in Black, you’ll have a similar, but much longer experience. James Still’s play is not filled with historical revisionism, nor is it adapted to be palatable for a worldwide audience. This isn’t just another theatre piece meant to make white people feel good that Mr. Lincoln ended all racial issues in 1862. Still’s piece addresses the issues of the time head-on, following Lincoln’s journey to write and sign the Emancipation Proclamation. Much like Disney’s attraction, the technical aspects of this play are quite amazing. The Lincoln Office set (designed by Angie Miller) is impressive on its own, small but imposing its symbolic importance onto every scene. This is enhanced by Michael Stanfill’s projections, taking us to other places across the country, or showing us maps of important military movements going on behind the scenes. Even in a small theatre, the sense of scale here is breathtaking at times. In a scenario like this, it would be easy for the performances to get lost in it all. In a good way, they do. The Heavens Are Hung In Black is filled to the brim with strong performers. To be honest, I’d have to lie to say much bad about them, but I doubt Honest Abe would approve of that. Lawrence Grimm may as well change his legal name to Abraham because he embodies the man like nature summoned him to do so. I was also partial to Drew Schad, who makes a great companion to Grimm as John Hay. If anything, I wish we could have seen more of their relationship. This touches on the only real issue I have with the play. Throughout, we’re shown Lincoln having dream sequences in which he meets various historical and cultural figures, each trying to push their positions on keeping America united, emancipating the slaves, and on Lincoln in general. Though this had potential to be an interesting examination of Americana and Lincoln’s personal turmoils, it does not live up to the task. Trying to separate the internal struggle from his external ones works against the script. It often feels more like we’re sitting in on a Socratic dialogue, not a human conversation. And while the actors are doing well, seeing who they’re playing is sometimes more hilarious than intended (Zach Bloomfield’s well done John Brown is somewhat undone by his over-dramatized long and clearly fake beard). The worst part of this is that it takes time away from the engaging scenes in which Lincoln is debating with his Secretary of War or Mr. Hay. I often wished we could return to the little office in the White House and see the great decisions and debates within. In the end though, one could say that type of whimsy is what makes those educational Disney rides good. We really don’t need Ellen DeGeneres and Bill Nye to go back to the time of the dinosaurs to understand how energy works, but maybe that’s part of the fun. In the end, even the worst parts of this play are good. Whether it’s Louis Contey’s directing giving us beautiful glides across the stage, Lawrence Grimm going all out as Lincoln, or just the pretty projections, every scene has something to love. I wasn’t as partial to Mr. Lincoln’s apparently telepathic communications to Jefferson Davis, but they were engaging in their own way. If you’re the kind of person who loves Space Mountain and goes past the Hall of Presidents, this isn’t a play for you. But if you’re feeling a bit down and out from the world today, and want a performance that will remind you of the greatness that came from this country’s struggles, then I can’t recommend this highly enough. Lenses: Age 18, Femme, White, Actor, Chicago native. Attending The Heavens are Hung in Black at Shattered Globe, I was provided with a new lens on a conflict I have learned about every year since I was in 2nd grade. The progression of the Civil War from a conflict rooted in the issue of secession to one rooted in slavery was interesting to watch. Ever since I can remember I have been taught that the Northerners were the noble, valiant, forward-thinking heroes that made the radical decision to see people as people no matter the color of their skin, and the Southerners a money hungry, backwards, racist group of no-good bad guys fighting to keep other human beings under their own power. Some of that hero aspect of the North was removed here, which I think is a good thing. Heavens is realistic in its portrayal of abolition as a political stance more than a moral one, the unfortunate order of things that is simply the way things are done in Washington. I’m a big history fan. The show was peppered with famous historical names, bringing to life what I had only read in countless textbooks over the years. This would have been sublime, if I had only remembered who these people were. Heavens expects a certain level of prior knowledge from its audience, which is not a bad thing. But I would be lying if I didn’t admit there were portions and characters that left me in the dust. This is not to say I wanted verbal rundown of every historical figure that graced the stage, that would have been awful. I only wish it were possible to have achieved some subtle explanation of a few of the less household names, like John Brown or Dred Scott, so that I was able to grasp the narrative a little better instead of having to Google them during intermission. Illinois is not necessarily well known for the honesty of their politicians. But Abe we’ve got, and we’re proud of him. I feel as though I have seen Lincoln a hundred times. This is an immense challenge for anyone attempting to portray him. Everyone watching already feels as though they know exactly what to expect from him. Lawrence Grimm gave us a look at the Lincoln we hadn’t seen. He was just as I expected, with the added bonus of intense sudden mood changes from profound grief to fatherly humor. I was a bit taken aback by the jovial nature of Grimm’s physicality, as Lincoln seemed to have a bit more of a spring in his step than was described in the weariness of his tone. Lincoln’s relationship with Mary Todd (Linda Reiter) was lovely, but absolutely eclipsed by that of Lincoln and John (Drew Schad), Lincoln’s private secretary. He lovingly and exasperatingly pushes Lincoln towards his necessary POTUS duties, and it’s a work marriage like I’ve never seen before. What I didn’t like was a scene where Lincoln heads to the Ford Theatre (not that scene) and meets a bunch of the actors during a rehearsal. He is casual and friendly, shaking hands with all of these average citizens and smiling, asking questions, being funny and charming. The single black actor in the show, Darren Jones, was the janitor here and spent this scene drooling across the stage at Mr. Abraham Lincoln. Eyes wide and large, reverent, smile. Lincoln did not give him the time of day, not even a glance. And yet our janitor here remained smitten, fat lip and all, mouthing big words like “solemnity” he heard being spoken across the room. I wasn’t too happy. Sure, I get it. Not treating POC with an ounce of human decency was (is) a problem, and that is part of the reason Lincoln is as famous as he is. Deeming those with a darker skin tone incapable of basic human understanding and regular emotion is why we were able to assign monetary value to a person and relegate them to a less than secondary status in society for decades. But I couldn’t seem to get behind this choice. I was just uncomfortable. Harmful stereotypes were being too heavily played into, and while I’m sure it was for the sake of historical accuracy and story, I was not down with it. The show ends with Lincoln crafting the Emancipation proclamation. And that’s great! But it left me a bit befuddled, as I all of a sudden found myself thinking, “Was this a show about slavery? Did I miss something?” Because although slavery was obviously not ignored, it didn’t seem to be the major focal point until late in the show. Wrapping up the play that way made me think that that had been the focus all along, making me feel as though the narrative was not clear. We had the privilege of discussing this play with members of the cast afterwards, and I asked them what Heavens was about. They responded with moral leadership, and I can see that. However with so many themes at play here—wrestling with grief and mental illness, fighting an enemy composed of your own men, the basic politics of war—I never felt grounded in any specific purpose, probably because the show’s length was excessive. I would have remained on board if a way had been found to make the production more concise. The Heavens Are Hung in Black is a history lesson that needs to learn what it’s trying to say before it tries to teach us. 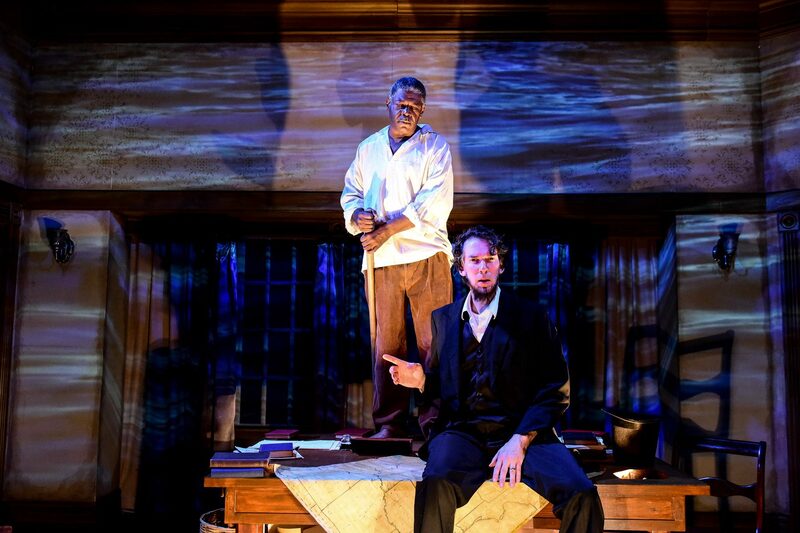 Shattered Globe’s The Heavens Are Hung in Black is a period piece centering around President Abraham Lincoln’s private life. We get inside Lincoln’s head (literally) in this two-and-a-half-hour show. I’m not much of a history buff, so I found myself learning something new every scene, but I also found myself fighting to stay interested—and often times, awake—due to the thickness of the history. The production’s small cast calls for lots of double casting, which leads to a particular choice I disagreed with. There was one black man in the show, so every time Frederick Douglass came to life, or the first black soldier, or a dream-depiction of Uncle Tom, actor Darren Jones was your guy. This was sloppy. The show was sprinkled with white folk and then they had this one black guy playing every black guy. I can’t tell if this was supposed to be metaphorical or a money saver, but it didn’t work for me. Though I disagreed with this choice, Jones did a magnificent job distinguishing each of his characters. The distinction was clear not only through Hailey Rakowiecki and Madison Briede’s costuming, but through actor choices such as physical habits or voice changes. On the other hand, Mary Todd Lincoln (Linda Reiter) was very one-note. You could tell she felt a great deal of pain over the death of her child, but that was the extent of her emotional range. The small space proved to be a distraction. It felt like I was watching history take place in a bathroom. I found it to be very claustrophobic and uncomfortable. Only four or five actors fit comfortably on the set without overcrowding, and the staging called for many more than five actors on the stage at once. The lack of space also made for some confusing settings; Lincoln’s study was not always Lincoln’s study and I would’ve liked to see how his mind was explored if the staging was bigger. I did enjoy Michael Stanfill’s projections. They provided a real mood change as well as actual context to the scene, and Lord knows I needed some context because sometimes I just did not see the correlation between two events. Often times a man would come downstage—offstage really, like not even on stage downstage—to speak to the audience. If I did not review my program I could not have recalled that that was Walt Whitman, nor do I recall what his purpose was. I’d actually like to see another version of this play without that character. Mix the whitest soap opera with the melodramatic first world problems of the TV sitcom Frasier and the discomfort and uneasy feeling of the movie Get Out and you have Leah Nanako Winkler’s Two-Mile Hollow. At first, Hutch Pimentel’s staging on Arnel Sancianco’s three-tiered set was confusing because there was too much was going on. But the different levels of the stage actually made a lot of sense as they fit into the soap opera aspect and jumping between the three main locations: the beach, kitchen, and dining. The family of white people is played by different race actors, and they complain about average first world problems that they don’t really do much about. At first I found this quite enjoyable and amusing, but the show quickly got more and more intense and gave me more discomfort, especially for the assistant to the famous acting son, Charlotte (Aurora Adachi-Winter). She’s the only character acting her own race who just wants to make it in this white world, but she quickly learns that working under a white man is not the best way to make it. Photos: Darren Jones and Lawrence Grimm in Shattered Globe Theatre’s Chicago premiere of THE HEAVENS ARE HUNG IN BLACK by James Still, directed by Louis Contey. Photo by Evan Hanover. Photos: Jose Nateras, Deanna L. Myers, Kai Ealy and Jazmín Corona in First Floor Theater’s world premiere of TWO MILE HOLLOW by Leah Nanako Winkler, directed by Hutch Pimentel. Photo by Juli Del Prete.